Winter is coming, and many people will be cold in their homes: almost seven million Spaniards have problems to keep their homes at an adequate temperature or to pay bills for energy supplies. 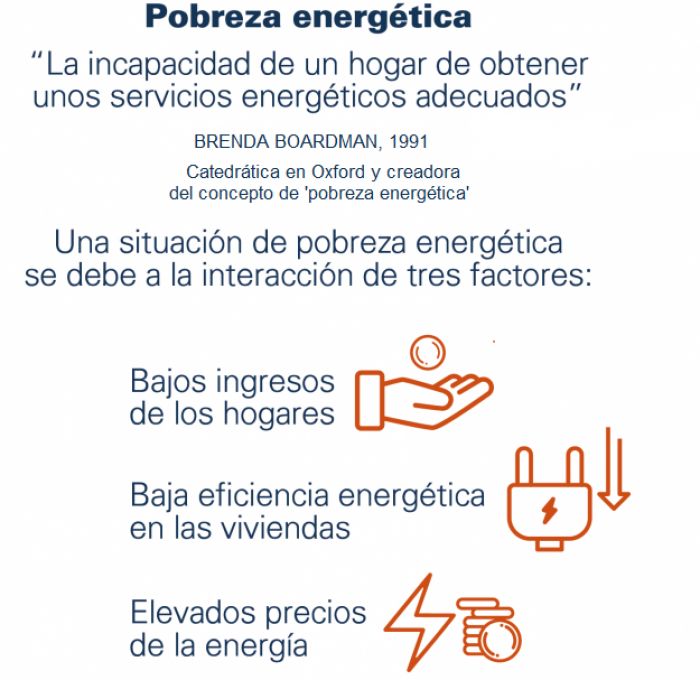 These are data of the last study on energy poverty by the Association of Environmental Sciences (Asociación de Ciencias Ambientales or ACA). Administrations, companies and entities seek solutions to this problem that has multiple social, economic and environmental consequences. In some cases, the institutions have opted for palliative measures, such as aid for the payment of supplies. However, entities like the ACA recommend prioritizing the improvement of housing efficiency. 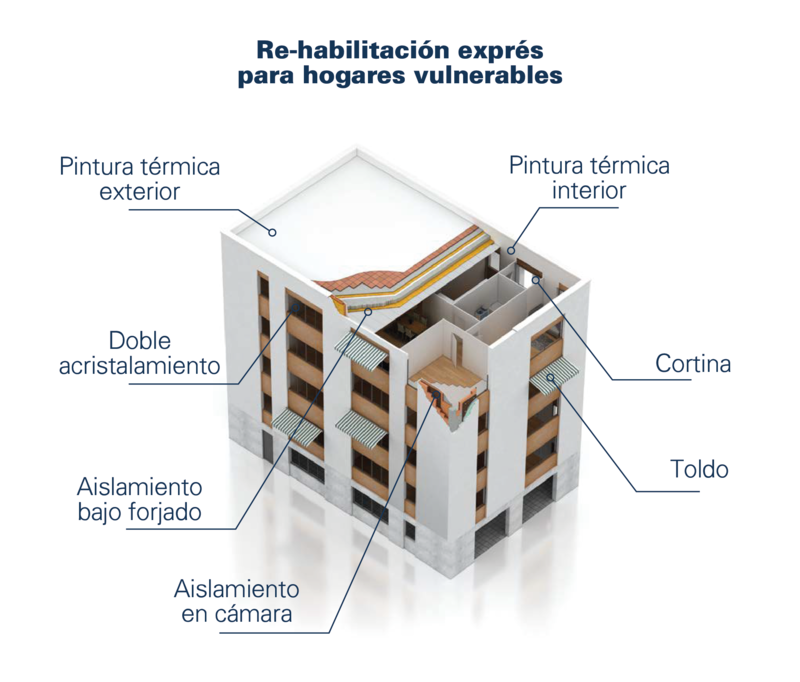 The energy rehabilitation of homes is key to achieving greater efficiency, especially in the numerous housing stock built before 1980, when the obligation to thermally insulate buildings came into force in Spain. According to various studies, by means of a simple work of reformation, a home could increase 22% of the days of well-being, without consuming extra energy, and could save up to 650 euros per year. Is it possible to carry out an express rehabilitation without large outlays to fight against energy poverty? How can it be financed? What is its impact in Spain? It is considered that a household suffers from energy poverty when it does not have enough resources to enjoy essential energy services such as heating, cooling, lighting or energy for the use of electrical appliances. This form of poverty is produced by a combination of low income, inefficient construction and high energy prices. According to the European Observatory of Energy Poverty, this phenomenon is related to numerous problems for the health and well-being of people. Low temperatures at homes can increase respiratory and heart diseases or aggravate the condition of those who suffer from them. 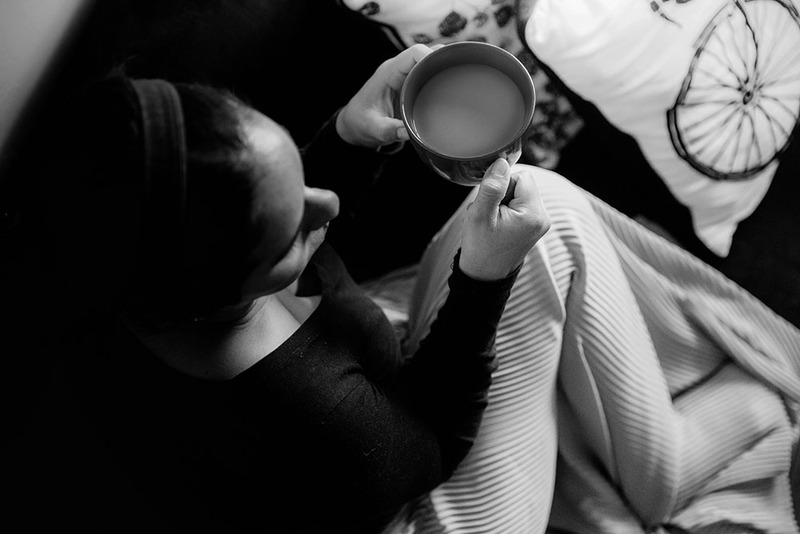 The stress caused by energy poverty can also contribute to developing mental health problems. This type of poverty also has consequences on the environment, due to the inefficient expenditure of energy. And on the economy, since the affected families must dedicate a high percentage of their income to the payment of basic supplies, something that diminishes their capacity of consumption. According to the 2016 study POVERTY, VULNERABILITY AND ENERGY INEQUALITY. 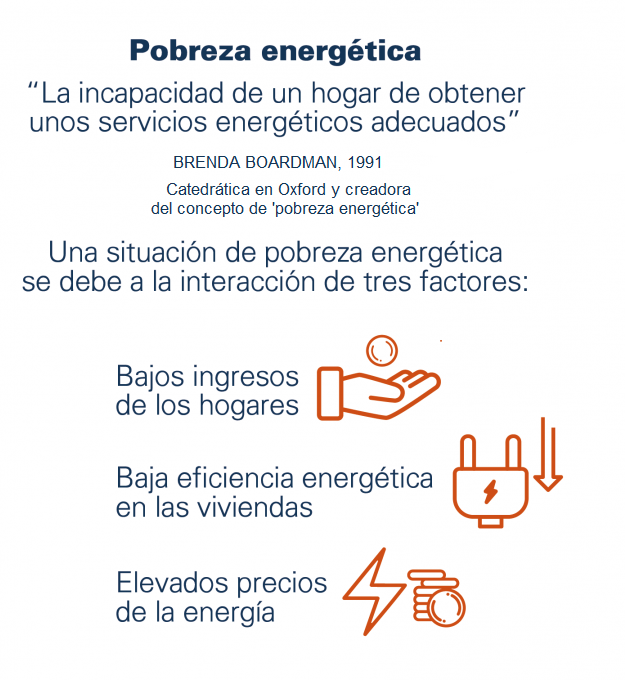 NEW APPROACHES OF ANALYSIS, in Catalonia, 15% of the population is in a situation of energy poverty considering the income of the inhabitants, meaning that they spend more than 10% of the income to the energy supply of the home. Extrapolating this data to the city of Barcelona, ​​there are approximately 242,000 people in this situation. Taking into account that the average size of households is 2.41 people (INE, 2015), about 100,000 households in the city could suffer from energy poverty, which is 14% of the 684,078 households (INE, 2011). HOW IS THE IMPACT OF ENERGY POVERTY IN SPAIN? 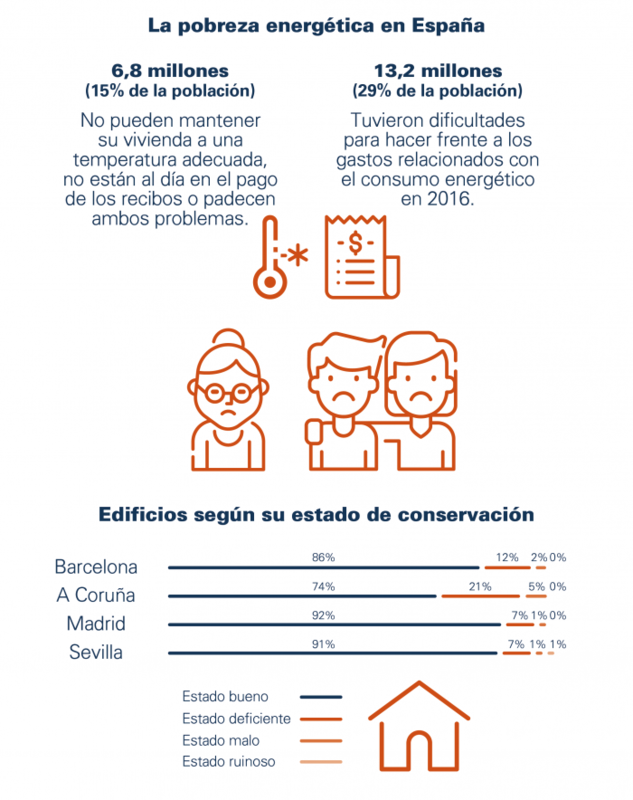 A total of 6.8 million people, 15% of the population living in Spain, suffers from inadequate temperatures in their homes, is not up to date in the payment of bills, or has both problems. This is indicated by the Energy Poverty study in Spain 2018, by the Association of Environmental Sciences (ACA). Also, according to this report, 29% of the country's population (13.2 million people) had difficulty coping with expenses related to home energy consumption in 2016. Another study by the Naturgy Foundation, entitled Express rehabilitation in vulnerable households. Low-cost solutions, has analysed the state of the housing stock in four Spanish cities: Barcelona, ​​A Coruña, Madrid and Seville. According to its conclusions, 14% of the buildings examined have a poor, bad or rundown state of conservation. Is it possible to improve the efficiency of households for little money, quickly and easily? It is, according to the study Express rehabilitation in vulnerable homes. Low-cost solutions, driven by the Naturgy Foundation. These are actions that can be carried out from inside the house and without requesting building permits or permits from the community of owners. In addition, they require low budgets, between 5,000 and 7,000 euros, far from the cost of a complete energy rehabilitation, which can cost between 20,000 and 35,000 euros. From this catalogue of constructive solutions, there are 12 that present a better relation cost / efficiency: these solutions comprehend vertical walls, carpentry and solar protection of the higher surface area of ​​the façade. Together with these, solutions for the roofs are also considered given that, as it has been proved, the top floor houses have high thermal transfers through the roof. According to the report, the application of a set of solutions (improvement of thermal insulation, replacement of carpentry and glass, and incorporation of solar protections) in homes shows a reduction in the energy demand in air conditioning depending on the location where it is found. In Barcelona, ​​the effectiveness of this intervention is verified, and especially in the most exposed homes (upper floors), where the demands are reduced 25% compared to the initial ones in the coldest months and 33% in the warmer months. On the first floor, the behaviour in winter conditions is substantially improved. The annual savings that this intervention would imply in the homes could reach 650 euros. With the aim of helping the most disadvantaged groups, in order to carry out works such as those proposed in the study, the Naturgy Foundation has created the Solidarity Fund for Energy Rehabilitation. It will finance express rehabilitations of houses, repairs and substitutions of equipment, working also for the adaptation to the safety regulations on gas and electricity installations. The entities of the Third Sector, among which are the Red Cross and Caritas, are those with which the Naturgy Foundation collaborates, those that propose the households of families that they attend in their vulnerability programs, whether they are in rent or property regime. Households proposed by public agencies, and the homes of people considered economically vulnerable consumers by the Unit of Attention to Vulnerability, area also attended. Several families have already been beneficiaries of the Solidarity Fund for Rehabilitation. "We had not been able to use hot water for more than a year", says M.P., inhabitant of Barcelona. His/her family has been able to undergo several rehabilitation works in his/her house. The most urgent has been the replacement of the evacuation tubes of the heater, that were broken, by new and more efficient, which has allowed the hot water to return from the tap. Also, the window of his/her bedroom’s children has been changed, since it was cracked and had some broken glass. Thanks to this simple installation, his/her family has increased welfare and has reduced their electricity consumption: "we had to put a radiator for a large part of the day" he/she explains, which augmented the electricity bill. In addition, the Naturgy Foundation has provided the family a series of tips to improve their consumption habits, such as replacing conventional bulbs with LEDs or reducing the use of the oven, which consumes a lot. "I am surprised by the savings we have seen in the bill", he/she concludes. In addition to the contribution of Naturgy Foundation, the Solidarity Energy Rehabilitation Fund is open to voluntary contributions. They can come from individuals, associations or another type of entity. The Naturgy Foundation proposes contributions that range from 1 euro to 10,000 euros, with the commitment to contribute with the same amount. The system to collaborate is simple and direct: it is only necessary to access the payment platform of the website of the Naturgy Foundation: www.fondo.fundacionnaturgy.org. "If we, social entities, administrations and companies work as a network, we can make a lot of progresses regarding energy poverty, the experience of our foundation is a clear example", says the general director of Naturgy Foundation, Martí Solà. Naturgy Foundation has signed agreements with different entities such as Fundación de Caridad La Constructora Benéfica, Fundación Habitat3, Fundació Foment de l’Habitatge Social, Caritas and Red Cross to select the beneficiaries of the fund.